Latest scientific analysis has revealed that more than 25,000 of Gabon’s forest elephants were killed between 2004 and 2014. 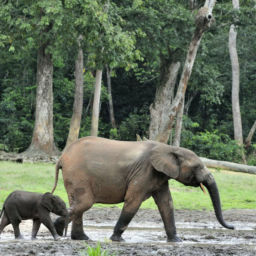 In other words, 80% of the forest elephants in this region were slaughtered in a period of just 10 years. A similar study in 2013 found that their numbers across Central Africa had dropped 62% since 2002. 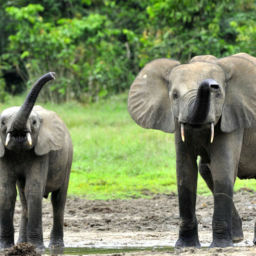 In the early 2000s it was estimated that there were 80,000 forest elephants remaining, half of which lived in Gabon. The country of Gabon is considered to have among the best conservation policies in Africa with huge protected areas, including Minkebe National Park, which is located around 700km north east of Libreville with an area of 7560km2 and is an integral area for forest elephants. Minkébé derives it’s name from the indigenous Fang people who once inhabited the Minkébé area before it became a protected zone. 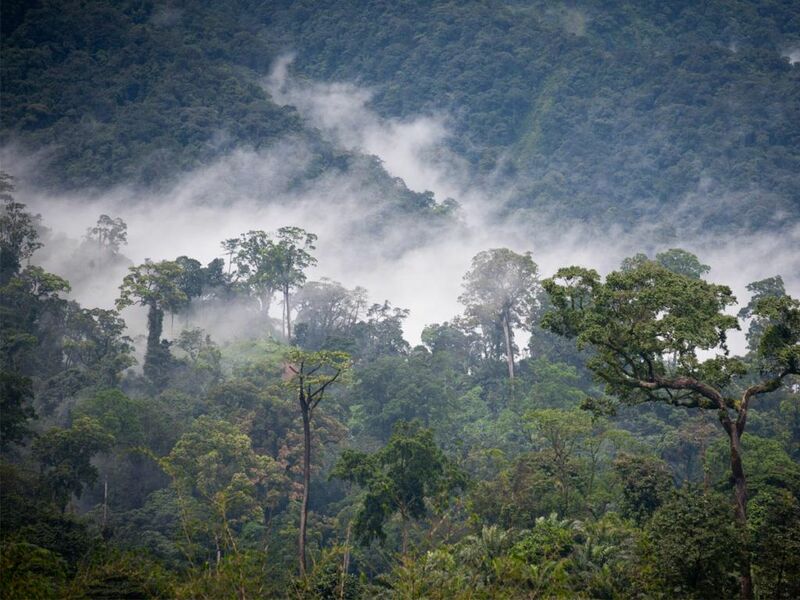 The Fang word ‘minkegbe’ means ‘valleys’ or ‘ditches’, which suitably describe the habitat with huge inselbergs emerging from surrounding thick rainforest. Many describe Minkébé as an an impenetrable paradise stretching as far as the eye can see seemingly uncorrupted by man. However the forest canopy is just a veil concealing the harsh reality that forest elephants are being slaughtered and their habitat being destroyed. 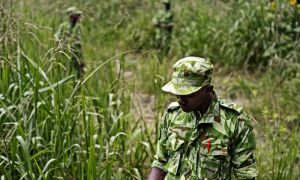 In the war against the illegal killing of African forest elephants, Minkébé National Park in Gabon is the front line. Minkébé consists of a pristine equatorial forest-ecosystem the size of Belgium and it supports the most important forest elephant population in Africa. The alarm bells were first raised in 2012 when an illegal mine was discovered within the national park containing at least 6,000 miners, prostitutes, drugs and arms traffickers. Amongst them were ivory, weapons and elephant carcasses. 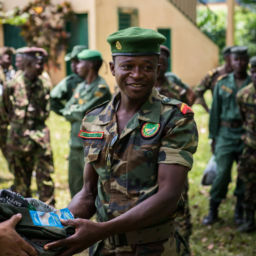 Thankfully, the Gabonese government sent the military to close the mine and remove the poachers. However, despite closing this mine, it was estimated that up to 100 elephants were being killed daily and that up to 77 percent of Minkebe’s forest elephants had been killed since 2004. To put this into context, it was estimated that in 2004, there were approximately 34,000 elephants in Minkebe. In 2014, it was estimated that there were just 6,500 to 7,400 left. this means that in 10 years, poachers had killed around 25,000 forest elephants. What is causing the poaching? Evidence suggests that poachers are not coming from Gabon, but from neighbouring countries, particularly Cameroon. Samples taken from elephant dung support this as studies show that the elephants are being pushed south from Cameroon. It has also become even more apparent that commercial logging is playing a huge role in poaching. Andrea Turkalo from the Wildlife Conservation Society has suggested that logging attracts people to the area in search of work, which in turn puts more pressure on wildlife. Logging results in more roads, which provide further access to hunters. This is supported by the fact that poaching is at its highest in the north-eastern corner of Minkebe, which is only 6km away from a main road in Cameroon. This area has little or no elephants remaining. With a huge rise in ivory prices in the last two decades, driven by demand from China, the forest elephant populations of Minkébé have crashed. As a result of this rise in the the price of ivory, poachers are taking advantage of the minimal infrastructure in this remote wilderness and consequently have almost unfettered access to the forests of Minkébé. Thankfully, China have agreed to shut down its domestic ivory trade in 2017. This should assist in reducing the high demand for ivory. This devastating rate of decline, in the order of more than 1000 per year, is unsustainable and if this decline is not reversed forest elephants will be wiped out of Minkébé and the surrounding forests within the next decade. Minkébé is a symbol of whether or not the world will secure the place of forest elephants into the future. If we can reverse the devastating decimation of forest elephants in Minkébé, then there is hope for forest elephants as a species across Central Africa. However, the battle to save the elephants of Minkébé is not lost. We must rally around to ensure security in Minkébé to prevent poachers’ free reign over the most important forest elephant habitat on the continent. Unbeknown to many people, there are two species of elephant in Africa – namely the savannah (or bush) elephant and the lesser known forest elephant. Aside from genetic differences, unlike their larger cousins, the forest elephant is smaller, darker, with straighter rusks and rounder ears. Forest elephant ivory is also more dense with a slight pink tint, making it even more valuable. Despite these differences the International Union for the Conservation of Nature, which is responsible for the classification of species according to their risk of extinction, refuses to consider forest elephants as a separate species. Why is this significant? It is significant because elephants are currently classified as “vulnerable” due to more successful conservation in other African countries. If the two species were separated then the forest elephant classification would almost certainly change to “critically endangered”. The savannah elephant would also probably change to “endangered” as well. This would also reduce the sale of ivory. Game rangers are necessary to win the war on poaching. They risk their lives on a daily basis to protect elephants, rhinos and other species in Africa. These rangers operate in difficult, often dangerous conditions, and cover large distances on foot every day. Despite the dangers, having human resources on the ground is invaluable to anti-poaching efforts. Although drones and high tech equipment is available, it is often extremely expensive. Investing the same amount in rangers will have a much more meaningful impact. In order to be effective they need high quality equipment, training and resources. This is vital for their own safety; their ability to protect wildlife; and also for their self-worth and the loyalty they feel to the difficult and dangerous challenges that they are faced with.